We are holding a Christmas raffle at The Two Rivers Kindergarten. There are some great prizes and winners will get to choose the prize that suits them best. 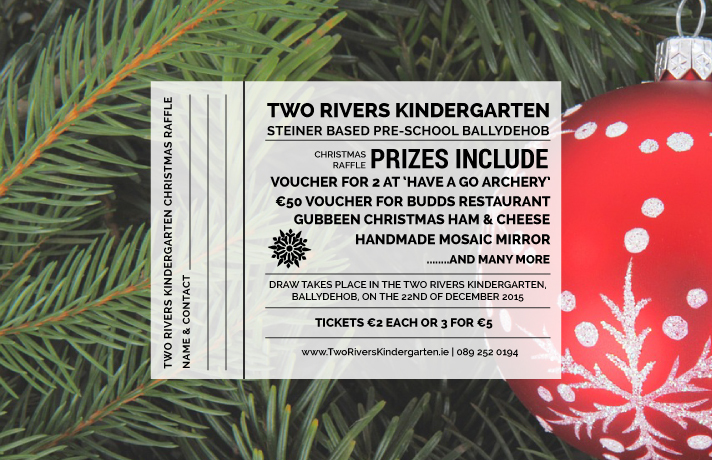 Prizes include a Voucher for 2 at Have a Go Archery, a €50 Voucher for Budds Restaurant, A Gubeen Farm Christmas ham & cheese, a Handmade Mosaic Mirror and many more! Tickets are €2 each or you can buy 3 for €5 and all proceeds go towards the Kindergarten. Tickets are available from any of the parents or will be on sale at the counter in Budds restaurant in Ballydehob. Please help to support our lovely play school.